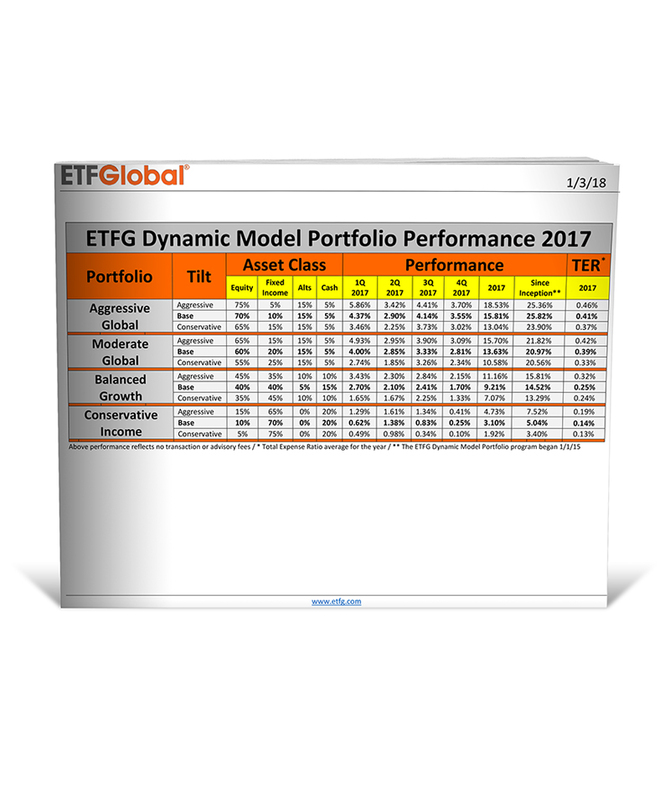 Each ETFG Dynamic Portfolio is comprised of the top ETFs as ranked by the ETF Global Quant model. The universe of U.S. 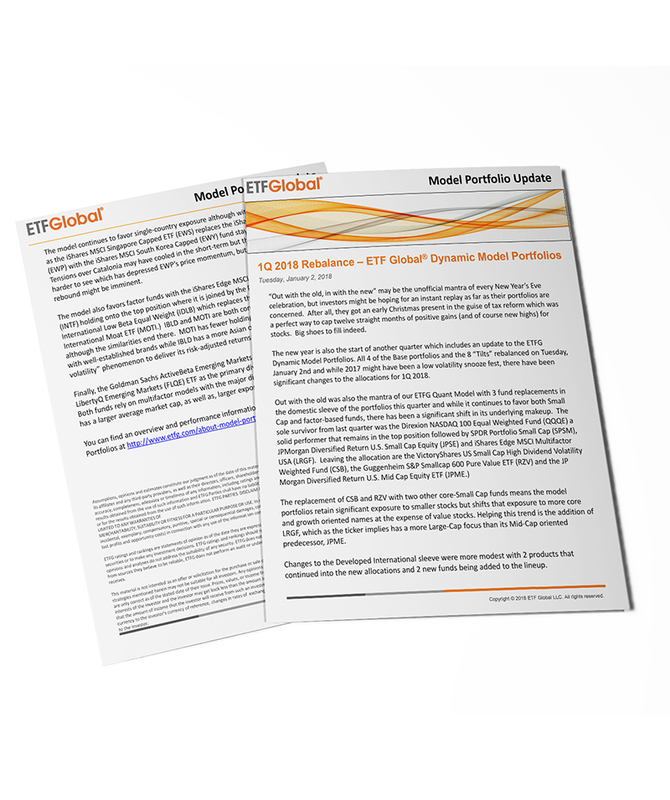 Listed, equity ETFs is reviewed by the ETFG Quant model daily and represents the broadest range of industry groups, sectors and geographic regions. Momentum: Captures the speed of price changes. This is the “wind at your back” factor. It captures the tendency for rising prices to persist in the future. Over/Under Bought: Measures how far “Stretched” a product’s move is and is based on the “regression to the mean” theory. Strength: Determines if there is a higher likelihood of persistence in a price move. Sentiment– This uses market based data to quantify how investors view or feel about the market. Each factor is measured and then weighted to get a single ranking value. Put/Call Ratio: This is the ratio of Puts to Calls using opening transactions. As the number of puts increases relative to calls, investors are saying that they think the market will decrease in value. Short Interest: When a stock is shorted, the investor borrows stock that they do not own and sells it in the market. The investor hopes to buy it back at a lower price to repay the loan. They are wagering that the stock will decrease in value. Contrarian in nature, the higher the Short Interest the more unlocked, upside may exist. Implied Volatility: This is a proprietary model that estimates the future volatility of the product. The process first employs a model free formula to extract what investors think the future volatility of a security will be. This data is primarily driven by current option prices. If satisfactory option data is unavailable on products that do not offer options, a number of statistical processes are used to compute future volatility from additional data points. Liquidity: This is a measure of both implicit and explicit liquidity and includes both Bid/Ask spread and volume of the ETF. This measure also allows investors to gauge how their trading might impact the price of the specific ETF. The higher the rank, the easier it should be for an investor to trade the security and to lower any implicit costs. Diversification: This measures how diversified an ETF is and the overall variance of the constituents. The diversification impacts the volatility of the ETF and reduces potential unwanted hidden exposures. Although not always the case, the general view is that the greater the diversification the better the ETF is structured and the smoother the path of returns. 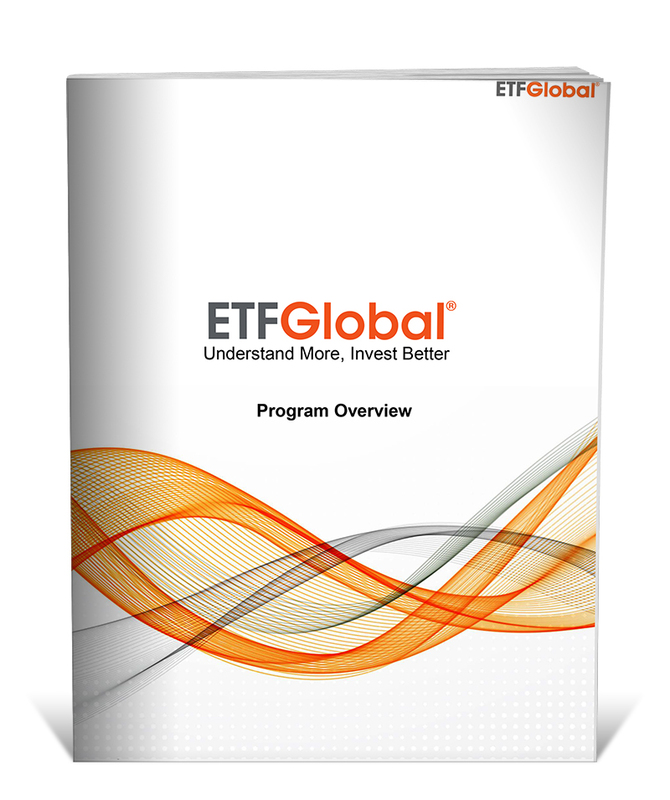 Sponsor Firm: This is a qualitative gauge of the quality of the sponsor of the ETF. Factors considered in this ranking include market position of the firm, size of the firm, ability to support losses and firm history. A well-funded established firm will rank higher than a startup firm just getting into the industry.